1. Toss all the ingredients into the crock pot (the tomatoes can go in whole). 2. Cover and cook on low for several hours, stirring occasionally. 3. Once the tomatoes have broken down some, uncover; and continue cooking until you reach the desired consistency (expect it to take at least eight hours). The cook time will depend on how much water is in the tomatoes. If it's been a rainy summer, it'll take longer for the sauce to thicken. 4. For chunky tomato sauce: pick the tomato skins and cores out of the sauce as it cooks (that's what I do). For smooth tomato sauce: run the finished sauce through a food mill. If you don't have a food mill, scoop the tomato cores out; then, give the sauce a quick spin in a blender or food processor. 5. Pour your finished tomato sauce into jars, taking care not to fill past the headspace line. Add one tablespoon of bottled lemon juice to each pint; two tablespoons to each quart. 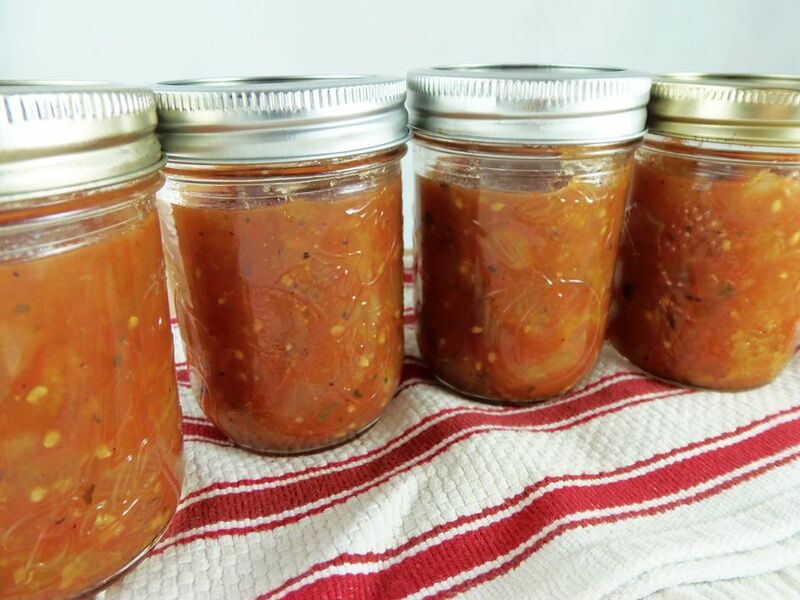 Modern tomatoes are not as acidic as they used to be, so this step is essential for safe canning. Water bath can pints for 35 minutes, quarts for 40 minutes. Refer to the National Center for Food Preservation to learn more about the current recommendations. Allow it to cool. Then, transfer it to freezer-safe jars or bags, and place them in the freezer. Use your sauce within one year, for the best quality. Thaw it in the fridge overnight, or speed up the process by thawing it in the microwave. For the best flavor, caramelize the onions and garlic in a bit of olive oil on the stove before you add them to the crockpot. Do your tomatoes seem to trickle in from the garden? Just freeze them until you have enough to make sauce. They can go in the freezer whole, and don't even have to be thawed before they go in the crockpot. This is also a good way to go, if you're short on time. Just freeze your tomatoes until you have time to devote to sauce-making. Prefer to make your tomato sauce on the stove? Here's a step-by-step tutorial to take you through the process. Have lots of tomatoes on your hands? Use some of them to make homemade tomato paste, tomato juice and salsa.